ARLINGTON, Va.–A technology designed to treat injured warfighters on the battlefield is proving its worth to civilian emergency-response teams. The sensor-laden Wireless Vital Signs Monitor (WVSM) tracks critical health information like heart rate, pulse and blood pressure. Sponsored by the Office of Naval Research (ONR), it weighs less than a pound and can be carried easily into combat zones or mass-casualty emergency situations. The device is strapped to a patient's arm and transmits data wirelessly via a specialized software app to a tablet or smart phone, which is handled by attending medical personnel such as Navy corpsmen. This enables the medics to monitor the vital signs of more than 15 patients at once. "Since this technology can monitor multiple patients simultaneously, corpsmen can attend to someone, move to the next patient or even step away to get supplies–while still keeping an eye on everyone in their care," said Dr. Timothy Bentley, a program manager in ONR's Warfighter Performance Department, which has sponsored the WVSM's development. A collaboration between ONR, the U.S. Army Institute of Surgical Research and industry partner Athena GTX, the WVSM recently was approved by the U.S. Food and Drug Administration. More than 200 of the monitors so far have been sold to emergency-response units in Iowa, Texas, North Carolina, Maryland, Missouri and Pennsylvania. The WVSM also is used currently by the U.S. Special Operations Command and the Air Force. Through complex software algorithms, the WVSM analyzes patient data; determines if someone is in stable or worsening condition; and calculates the need for life-saving interventions such as surgery or blood transfusions. This differs from traditional vital signs monitors, which provide basic health information but can't predict if someone's medical condition is about to deteriorate. First responders already have used the WVSM successfully in training exercises and emergencies such as fires, tornados, hurricanes and large public events where groups of people required medical attention. In June, Texas emergency crews treated people injured during a hospital explosion. "The feedback from customers has been very positive," said Dr. Mark Darrah, president and chief executive officer of Athena GTX. 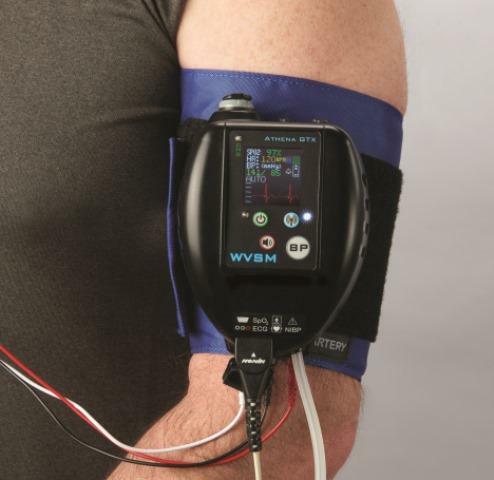 "They like that the WVSM is lightweight, portable and can provide crucial vital sign data quickly. The sooner you can receive such data, the better the outcome in an emergency." The WVSM is designed as part of the ONR-sponsored Automated Critical Care System (ACCS)–a patient-care system that can be described as an intensive care unit in a suitcase. Weighing under 25 pounds, with an accompanying stretcher, ACCS is ideal for diverse missions. "Expeditionary forces penetrate deep into remote areas where casualties can take hours or days to evacuate," said Bentley. "The capabilities needed for patient care must be compact, lightweight and scalable to mission requirements. ACCS makes the clinical expertise and capabilities of a critical-care center available to warfighters in the most severe conditions." ACCS can provide care such as vital signs monitoring; resuscitation and breathing assistance; supplemental oxygen; fluid and drug therapy; and patient data gathering, storage and transmission. The system can monitor and treat patients under the control of a medic–or autonomously within pre-determined parameters.